The Annual Canadian Lawyer Corporate Counsel Survey found the use of AFAs has declined from last year, but experimentation continues. As in-house counsel continue to experiment with alternative fee arrangements, there has been a shift toward looking more at overall value — whatever fee arrangement is ultimately used. This year, 4.9 per cent of respondents to the Canadian Lawyer Corporate Counsel Survey said they use alternative fee arrangements with their primary law firm. Last year, the number was 12.7 per cent. Stephen Rotstein, chairman of the Canadian Corporate Counsel Association, doesn’t think the whole idea of AFAs — whether you’re looking at alternative or appropriate fee arrangements — is going away, but he does see it as going through a transition. Because of the cost certainty and predictability in-house counsel are looking for, they’re always going to be receptive to new ideas. Lorne O’Reilly, senior counsel at Dow Chemical Canada ULC in Alberta, suggests the drop in reported usage may come down to what people are reporting as an AFA, a factor of familiarity of what’s out there or simply the fact that AFAs have been tried, but in a number of circumstances the traditional hourly billing rate provides the best value. He also wonders whether in-house counsel are nervous about losing their jobs and trying to internalize more work or if they are too rushed to analyze what’s best for their billing. O’Reilly says that whatever might be happening with AFAs, it continues to be a hot topic and the senior leadership he talks to still expects some sort of different fee arrangement from the external counsel with which they work. Rotstein agrees, saying that, in his experience, external law firms are looking for ways to provide models of billing that work for corporate clients. “I think we’re an evolving legal market where constantly things are tried and if they don’t work we try something else,” he says. O’Reilly says most firms are more than willing to work on a different fee basis in Alberta. Some are providing a budget and identifying different expertise that can be provided such as a project manager. He wonders if any pushback on AFAs stems from poor RFPs that are being put out where the firms have to put a considerable amount of work into trying to understand what the organization wants. Billable hours are back as the most common billing arrangement in-house counsel have with their primary law firm or external service provider, sitting at 50.2 per cent this year compared with 46.8 per cent last year. Staying in line with what the survey said last year, flat fees are still the least popular option, weighing in at 2 per cent. 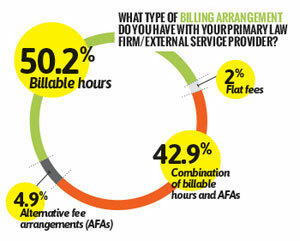 The combination of billable hours plus AFAs spiked to 42.9 per cent from 31 per cent last year. “I think the challenge has always been, both for our organizations being in-house organizations and law firms, how to structure models that work for both players in the arrangement,” Rotstein says. Despite the mixed results, the percentage who said more than 75 per cent of the work they send out falls under an AFA held more or less steady, at 6.3 per cent this year versus 5.9 per cent last year. Also, 78.8 per cent of respondents say they are interested in engaging with their law firms in AFAs. But of the 21.2 per cent who aren’t interested, 22.5 per cent of that group admit they don’t fully understand AFAs — this could be because in-house counsel haven’t had the opportunity to use them in a matter and explore the possibilities. O’Reilly says his company is looking to its external service providers and asking for a budget for every matter. While 65.6 per cent choose external law firms based on specific lawyers — with one respondent commenting that lawyers “need to know your stuff, [be] cost effective, but most important is the relationship . . . are you making life easier?” — O’Reilly suggests in-house departments branch out in who they hire. However, as 56.4 per cent of respondents made clear, choosing the external firm based on industry/practice area expertise is an important consideration. The remaining respondents said 40.1 per cent choose their external firms based on technical expertise and 30 per cent choose based on reputation. More than 300 law department leaders from corporations and government completed the survey. Similar to last year, 62.1 per cent of the 303 respondents said the volume of legal work carried out by their department and external counsel was likely to grow. Having their company in growth mode was the top reason at 72.5 per cent, while 23.9 per cent said they would grow because of a company-made acquisition and 21.1 per cent projected growth based on a one-time project. Multiple respondents noted increasing complexity and more activity in the industry as key influencers on their company’s growth rate. Despite more than 60 per cent saying they expected more work, when asked if the size of their legal department changed over the past year, only 27.4 per cent said it grew, noting it was because there was more work to be done. A little more than half — 50.8 per cent — said department size remained the same. According to 8.9 per cent, vacant positions were filled, and 12.9 per cent said they saw the legal department shrink. Rotstein says there is continued growth in in-house departments. When he talks to in-house counsel, there is a consistent theme of getting more work and hiring more lawyers, and as a result, the relationship between external legal providers and in-house departments is changing as well. He says there’s a need for a well-stocked in-house legal team that can identify risk and manage it before “the horse has left the barn” and the company ends up in an undesirable situation. When it came to external spend, 27 per cent said it changed because more work was being brought into the legal department, up from 20.4 per cent last year. Only 4.3 per cent said external spend changed because they were sending more work out — last year, the number was 9.2 per cent. O’Reilly says there’s been a lot of consolidation, and that makes sense given the state of the market, especially in Alberta, where there’s been a significant slowdown internally with organizations not undertaking projects like they did in the past or “may be cash-short on the balance sheet. “In order to reduce risk of the legal department losing jobs you want to make sure they’re as busy and providing as much value for the organization as possible,” O’Reilly says. Rotstein says most corporate counsel still work in small in-house departments, despite the recent uptick in hiring he’s noticed. Some 51.2 per cent of respondents have less than five lawyers in their legal department, 24.1 per cent have six to 15 lawyers, 9.9 per cent have 16 to 30, 4 per cent have 31 to 50, 5.6 per cent have 51 to 100 and only 5.3 per cent have more than 100. He says some big corporations have in-house pricing departments, and while smaller in- house departments don’t have those resources, he predicts it will become a trend as in-house departments grow. A variety of sectors took part in this year’s survey, with 19.1 per cent from the financial sector, 17.5 per cent in government, 14.9 per cent in the industry or manufacturing sector and 12.2 per cent in the resource-based sector. Lawyers working in the technology sector made up11.6 per cent of respondents, 9.9 per cent were from the service sector, 7.9 per cent in the non-profit sector and 6.9 per cent in the professional services sector. In keeping with survey results from past years, 9.9 per cent had more than $10 million available in external legal spend over the last fiscal year. Of the respondents, 5.6 per cent spent between $5.1 and $10 million, 7.6 per cent spent between $3.1 and $5 million, 22.1 per cent spent between $1 million and $3 million, 16.2 per cent spent $501,000 to $1 million, 25.1 per cent spent $101,000 to $500,000 and 13.5 per cent spent $100,000 or less. Litigation took the top spot again as the area in-house counsel outsource the most, with 72.2 per cent of the vote. Employment law took second, with 50.7 per cent, up slightly from last year’s 46 per cent. There was a slight drop in the percentage of mergers and acquisition work sent out, coming in at 30 per cent this year, down from 31.9 per cent previously. Rounding out the top five, 27.3 per cent sent out intellectual property work and 26.4 per cent sent out tax work. Click here for a full pdf of the survey.